Lightweight and robust die-cast aluminum chair base is polished to a high shine. Manufactured for strength, endurance and appearance. Ideal for office and medical environments. Center hole diameter 1.97" (50mm). This is the standard measurement on most office chairs sold in North America today. Older chairs and some imports may be different. 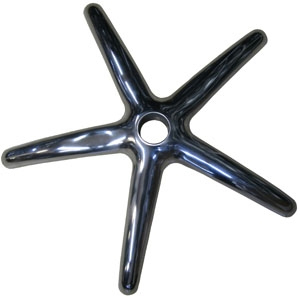 Casters to use: 7/16" grip ring style stem either 7/8" or 1" in length. Compatible with Salli Saddle Chair, Bambach Saddle Seat, and other chairs with 50mm pneumatic cylinders.